Nancy paints her ‘Karrku’ story. The word karrku refers to a large hill about 800 kilometers west of Alice Springs and to red ochre. Many of Nancy’s paintings depict women grinding wangunu, a grass seed used to make traditional damper. Apart from the symbols used to represent the women (U-shapes) and their activities (concentric circles), Nancy depicts sand hills, (tali) and the rocky hills (puli) as a series of curved linear patterns. 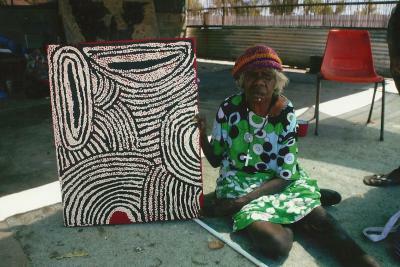 Nancy was included in the Kiwirrkura Women’s project the result of which was a large painting auctioned to raise funds for the Kintore renal unit. This painting is published in the Papunya Tula’s ‘Genesis and Genius’ book published by the Art Gallery of New South Wales. ‘Marrapinti’ - A site where women gathered for ceremony during the time of creation. They gathered ‘kumparapara’, a native tomato. The dried fruit was ground to paste and baked in hot coals. Nancy Ross Nungurrayi was born in the desert at Karrku, a large hill about 800 kilometers west of Alice Springs. 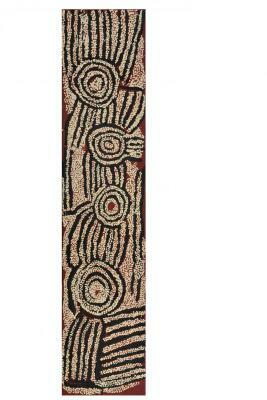 Nancy was the sister of Naata Nungurrayi and George Tjungurrayi, both well known artists. Until her death, Nancy and her family lived in Kintore.Nancy painted complex series of patterns that depict the holy places from the "Dream Time" (Tjukurrpa) around her traditional homel . . .